Peptide (C)DDYG RPGIE KFREE, corresponding to amino acid residues 216-229 of human CaSR (Accession P41180). N-terminus, extracellular. Homology Rat, mouse, bovine, canis - identical. 1,2,5. Anti-Calcium Sensing Receptor (extracellular) Antibody (#ACR-004), (1:200). 3,4,6. Anti-Calcium Sensing Receptor (extracellular) Antibody, preincubated with the control peptide antigen. ___ Cells + Anti-Calcium Sensing Receptor (extracellular) Antibody (#ACR-004), (10 µg/5x105 cells). Cell surface detection of CaSR in live intact rat glioma C6 cells. 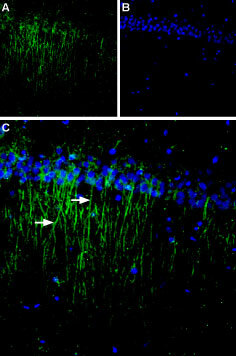 A. Extracellular staining of cells using Anti-Calcium Sensing Receptor (extracellular) Antibody (#ACR-004), (1:50), followed by Alexa-555-conjugated goat-anti-rabbit secondary antibody. B. Nuclear fluorescence staining of cells using Hoechst 33342. C. Merged images of panels A and B.
Racz, G.Z. et al. (2002) Gut 51, 705. Canaff, L. and Hendy, G.N. (2002) J. Biol. Chem. 277, 30337. Chattopadhyay, N. (2006) Am. J. Physiol. Endocrinol. Metab. 290, E761. Recent studies demonstrated the expression in human colon epithelium of CaSR, which regulates proliferation and differentiation. In colon carcinomas, lower levels of expression were found in the cancerous tissue compared to normal colon tissue. Anti-Calcium Sensing Receptor (extracellular) Antibody (#ACR-004) is a highly specific antibody directed against an epitope of the human CaSR. The antibody can be used in western blot, immunohistochemistry, indirect flow cytometry, and immunocytochemistry, and live cell imaging applications. It has been designed to recognize CaSR from human, rat, and mouse samples. Graca, J.A. et al. (2016) Am. J. Physiol. 310, F518. Sun, J. et al. (2013) Differentiation 85, 32.